1. 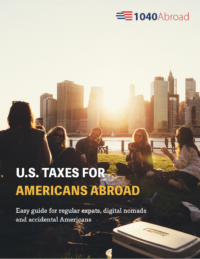 What deductions and credits are available for U.S. expats? 2. How do I qualify for Foreign Earned Income Exclusion? 3. What are itemized deductions? 4. I have a kid, can I use Child Tax credit? 5. What is Self-Employment tax and how do I use it? There are a few deductions and exemptions available to a U.S. person who lives and works overseas. These will help you to lower your expat taxes and might even get you a refund. If you meet certain requirements, you may qualify for the foreign earned income and foreign housing exclusions and the foreign housing deduction. The most common deduction is the Foreign Earned Income Exclusion, which is calculated on Form 2555. If you qualify for this you may exclude up to $101,300 of your foreign earned income. To qualify, you will need to meet either the Physical Present Test or Bona Fide Resident Test for living outside of the U.S.
Foreign Housing Exclusion or Deduction is another option that can save you some money on your taxable income. You need to be either a salaried employee, a wage earner or a self-employed individual to qualify for this deduction. It’s in an addition to FEIE and increases the exempted income by the amount of your qualified housing expenses. Depending on the country of your residence, the allowable deductions for the foreign housing will vary and are subject to limitations. Tax credits allow you to lower the tax due after your taxable income has been fully calculated. Your tax credit may include what you have already paid to your resident country. Foreign Tax Credit is useful for any expat who has paid taxes overseas. This option does not require a person to prove their residence in an overseas location. If a U.S. citizen works overseas or is involved in foreign investments, it is likely that they have paid taxes to a foreign government. If the tax rate of the foreign country is equal to, or greater than, the U.S. tax rate, the Foreign Tax Credit will successfully rid the expat of any U.S. tax obligation on that amount. If you chose not to claim the credit, foreign income taxes can also be taken as a deduction instead. Report it as a deduction on your schedule A for your 1040 Form. Child Tax Credit and Additional Child Tax Credit are the real bonuses for people with children as their dependents. For each eligible child, you may receive credit of up to $1,000 to offset your tax owing. You will need to list this on Form 8812. It is disallowed if you claim the FEIE, but you can go along with FTC, which is the regular Child Tax Credit. Additional Child Tax Credit will help you to get any remaining credit refunded. It is entered as “payment” on your tax return. Your child must also meet the requirements if you are to be eligible to use these credits. They must be aged 16 or younger, a U.S. person and resident of another country. There are also income limitations for claiming Additional Child Tax Credit. The U.S. and some other countries have a Totalization Agreement, which covers the amount of ‘credits’ that are accrued for old age or social security plans based on your work and salary. It is also beneficial for a self-employed U.S. person as it informs the IRS that the taxes are being paid to the home tax country. Make sure that your resident country has such an agreement before claiming its benefits. A Tax Treaty is a document between the U.S. and the foreign country, which states what can and cannot be taxed in each respective country. This type of deduction prevents them from taxing foreign-sources dividend, interest or royalties income that has already been taxed in your resident country. If you receive these types of income and live in a foreign country that taxes them at a lower rate than the U.S., it’s beneficial for you to use this. You need to remember that every tax treaty is different and you can always contact us regarding your situation. • Real estate taxes on your personal residence. You can deduct charitable contributions made to a U.S. charitable organization that transfers funds to a foreign charitable organization. You also can deduct the real property taxes you pay which a foreign country imposes on you. Also, a U.S. expat can claim an exemption on their return for a nonresident alien spouse if: your spouse has no gross income for U.S. tax purposes and is not a dependent of another U.S. taxpayer. Another test is called the Physical Presence Test and it’s applicable if you are physically present in a foreign country or countries for 330 full days during a period of 12 consecutive months. However, the 330 qualifying days don’t have to be consecutive. This test is based only on how long you stay in a foreign country or countries. It does not depend on the kind of residence that you establish, your intentions to return to the United States or the nature and purpose of your stay abroad. Generally speaking, it means that if you are on vacation, you can count those days in order to pass the physical presence test. However, if you are in a foreign country in violation of U.S. law, then you will not be treated as physically present there and the income that you earn from sources within such a country will not qualify as foreign earned income. In determining whether the 12-month period falls within a longer stay in the country, these 12-month periods can overlap one another. Schedule A is used to claim itemized deductions and there are seven categories: medical and dental expenses, taxes, interest, gifts to charities, causality and theft losses, job expenses and certain miscellaneous deductions. These include things like state income taxes, mortgage interests on a principal residence or on a holiday home, and property tax on your principal residence. By using itemized deductions, you can also claim charitable contributions to U.S. charities. Donating to charity can add up, but your donations must be made to organizations under U.S. laws. Canada and Mexico have treaties with the U.S. that allow deductions for contributions to be made to certain Canadian and Mexican charities. You can also claim unreimbursed employee business expenses above 2% of the adjusted gross income. You can deduct moving expenses, and in later years, have deductible storage expenses, which can be claimed throughout the foreign assignment. If your medical expenses exceed 10% of your adjusted gross income, then you can deduct part of them. If you or your spouse were born before January 2nd, 1951, then you may deduct medical and dental expenses that exceed 7.5% of your adjusted gross income, or 10% if you are 65 or under. Some deductible expenses include insurance premiums for medical and dental care, prescription medicines, medical examinations, diagnostic test, nursing help, surgeries, medical aids etc. The next itemized deductions include local and state income taxes or local and state sales taxes, but not both. Typical deductions include real estate taxes and personal property (vehicle) taxes. If you’re a homeowner, this includes mortgage interest and it can sometimes be advantageous to itemize if you own a home. You can also deduct mortgage insurance premiums and points associated with mortgages. Talking about causality and theft losses: if you have faced loss to your property due to casualty, disaster or theft, you will be able to take a deduction for the loss. The process can be quite complex, and you will have to complete a special tax form (Form 4684) in order to support the claim. Certain unreimbursed expenses related to your job may be deductible as well. You can also deduct your U.S. expat tax preparation services, in addition to other things like expenses incurred to earn taxable income (investment expenses, safety deposit boxes etc.). It is worth noting that you must total all of these expenses. Only the amount that exceeds 2% of your adjusted gross income can be deducted. Other miscellaneous deductions contain a variety of deductible expenses, such as gambling losses, losses from partnerships, unrecovered pension investments, and impairment-related work expenses for a disabled person. So, there are many things to consider. Contact us now and we will be happy to explain how it works, and also make sure that you reduce your taxable income by claiming the maximum deductions. Your child is aged 16 years or younger, as of December 31 of the tax year. Your child is a U.S. citizen, U.S. National or U.S. Resident Alien and has a social security number. There is an exception for an adopted child. You have earned income as an employee or from self-employment. The amount of the credit is tied to the amount of your earned income. The credit is limited if your modified adjusted gross income is above a certain amount. The amount at which this phase-out begins varies, depending on your filing status. For married taxpayers filing a joint return, the phase-out begins at $110,000. For married taxpayers filing a separate return, it begins at $55,000. For all other taxpayers, the phase-out begins at $75,000. In addition, the Child Tax Credit is generally limited by the amount of the income tax you owe, as well as any alternative minimum tax you owe. With the Child Tax Credit, you can reduce your federal income tax by up to $1,000 for each qualifying child. Your child must be either your son, daughter, stepchild, foster child, sibling, stepsister/brother or a descendant of any of these individuals. A legally adopted child is treated as your own child. The child must not have provided more than half of their own support and you need to claim them as a dependent on your federal tax return. The qualifying child should have lived with you for more than half of the tax year, and there are some exceptions to the residence test. There is also an Additional Child Tax Credit, which allows you to get a refund if the amount of your Child Tax Credit is greater than the amount of income tax that you owe. If you are a self-employed U.S. citizen or resident, the rules for paying self-employment tax are generally the same if you live abroad. The self-employment tax is a social security and Medicare tax on net earnings from self-employment. It applies no matter where the work is performed in the world. If your business has generated a loss and your income is less than $400, then you won’t owe any self-employment tax. You must take all of your self-employment income into account when figuring out your net earnings from self-employment. As of 2016, the rate for Self-Employment Tax is 15.3%. It consists of two parts: 12.4% for Social security and 2.9% for Medicare. For 2016, the maximum amount of net earnings from self-employment that is subject to the social security portion of the tax is $118,500. All net earnings are subject to the Medicare portion of the tax. If you do not live in one of the countries mentioned above, then you may be obligated to pay Social Security tax in both the U.S. and your country of residence. Social Security is a tax that should be paid by employees of all American employers, regardless of their location. One of the ways to minimize your tax burden is to establish your business as a foreign corporation (under the laws of any other country) and make yourself an employee of the corporation. Since you will no longer be self-employed, the wages you earn will not be subject to Social Security. However, you will need to file Form 5471 to report the interest in your foreign corporation for each year it continues to be true. Failing to contribute to your Social Security will impact your future benefits at retirement and so you will need to decide what’s more important for you in the long-term.